One of the greatest challenges for an instructional technology professional, faculty member, or media producer is determining the best video encoding workflow for their source media content. In this six-part blog series, video guru (and Ensemble VP of Marketing And Sales) Scott Nadzan will discuss some common media sources uploaded/ingested into Ensemble Video, and help you figure out which video workflow/encoding recipe will ensure videos are optimized and ready for playback on iPads, iPhones, computers and other devices. I could go on for days. There are just so many hardware and software tools at our fingertips, from very simple (and affordable) camera phones to very complex (and expensive) editing suites. Depending how you look at it, all these options can be exhilarating or exhausting. If you’re like me, I get intoxicated with this stuff. 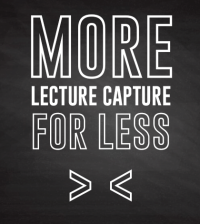 I love that a user can choose a software tool or acquire a low-cost video capture device that they prefer and easily produce a video, then upload it into Ensemble Video in a matter of minutes. At Ensemble, we work with a lot of customers that allow their users to choose a video creation tool that they are comfortable with, whether it’s super simple or cheap, or they don’t want to learn a new way to make a video. These customers enable their users, and typically this reduces friction because the users are just happy a new video tool isn’t being shoved down their throat. With that said, there is some risk here. The users may be happy, but it may be very difficult to control the control costs, support the variety of tools and there are unique training needs. 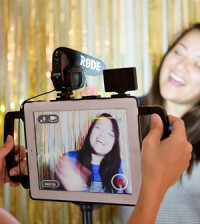 I can also can appreciate the other perspective, as the number of non-standard video creation tools in an organization increases, so does the work for instructional technology staffers, technology support is more complex and usually it means more money is spent. Some Ensemble Video customers make strategic investments in video tools and product eco-systems so all of their users are using the same video tool to create video content Basically, the leadership believes they need to limit the choices to control costs, reduce the variety of support requests and simplify training efforts. This strategy certainly can work for all parties involved, we just hope the users participated in the selection process, if not, the leadership will spend a lot of time selling the new product(s) to users and I’ll bet you their will be some friction in that sales process. 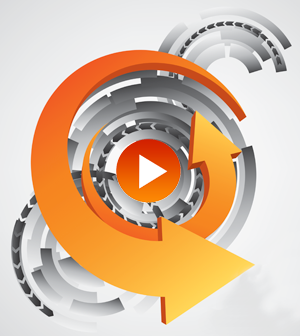 Have You Tried Flexible Video Workflows? If you get intoxicated with all these tools, or if the idea of non-standard video tools makes you cringe, YOU ARE NOT ALONE. Luckily, I think I can help you define a small number of video workflows that will be compatible with your all your video sources. What I’m saying is I’m going to try to simplify your worklife! Don’t believe me? 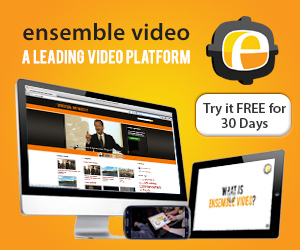 I guess you have to take my word for it, but the truth is many of our customers uses Ensemble Video because it offers a wide variety of flexible video workflows to simplify video creation and video ingestion with usually does simplify user support and training needs. Again, my goal is to help you determine video workflow processes that will ensure your videos are prepared properly for playback on iPads, iPhones, computers and other devices. Keep in mind these workflows will always including an “encoding” step. Whether you know it or not, all of the videos we watch on our iPads, laptops and mobile phones go through an encoding process to convert the original “source” video to a streaming format. If the word encoding throws you off, this process is also referred to as “transcoding,” “converting” or “video conversion.” In our case, on the output/streaming side Ensemble Video requires MP4 files (encoded with the H.264 codec). Also, I’m going to assume you have a pretty good idea how to capture and edit video, but when we start digitizing and encoding you’ll need to pay close attention to the format, resolution, bitrate, and fps of the output file. Aspect Ratio: The ratio of the width of the picture to the height. Displays commonly have a 4:3 or 16:9 aspect ratio. Program material may have other aspect ratios such as 2.35:1, resulting in it being “letterboxed” on the display. Bandwidth: The speed and amount of data that can be transferred in a given period of time. Higher bit rates mean higher quality media can be streamed or played back. 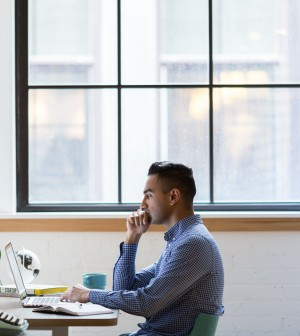 Overall bandwidth depends upon the processing speed of your computer, along with the network or Internet connection. Bit/data rate: This is the amount of data that each second of video uses. Typically, this is measured in kilobits per second. Bit rates can be either Constant or Variable. A constant bit rate stays the same throughout the video, which can lead to larger video files. A variable bit rate changes depending on the amount of action on the screen, which will lead to smaller files. Variable bit rates can decrease quality if the bit rate does not change dynamically enough with the video. Experiment with both bit rates to find a balance between size and acceptable quality. Codec: Compression-Decompression. Highly specialized algorithms that analyze content of the media, using a variety of rules to remove or exclude redundant information within the video or audio material to greatly reduce the size for storage, transmission and playback efficiency. There are many CODECs, each designed for specific purposes. Virtually all digital media used in consumer applications are compressed. Encode: Often used in the same context as compression. Taking one media format and making it into another. e.g., used to change original content from a Non-Linear Editing system (NLE) to a new format in a smaller size to save space and play on a different type of system such as DVD or Blu-ray. Also referred to as Transcoding. File Format: A general term that is often used interchangeably to mean the container format or (incorrectly) a codec itself. Common formats include: AVI, MP4, WMV, 3GP, QuickTime, SWF, MPEG, M4V, RM, DVD, DVR-MS, MKV and FLV. Frames per second (FPS) or Frame rate: this is the number of frames per second. Videos are typically shot in 24 or 30 frames per second. Keep the compressed copy’s frame rate the same otherwise playback will be affected and audio may not sync properly. H.264: A codec which is part of the MPEG-4 standard for high definition video. H.264 is very efficient and enables delivering very high quality at relatively low bit rates. This is especially useful for Internet content and use on mobile devices. It is also one of the mandated standards for Blu-ray, being capable of encoding video at high bit rates. MP4: A popular container format, which can carry the H.264 codec for very high quality video at low bitrates. Resolution: For digital video, measured by the resolvable detail given the number of the vertical and horizontal pixels on a display device. This is the size of the outputted video. It is measured in pixels, width x height.Other factors such as spatial (still images), temporal (moving images or objects) and the perceived resolution of the viewer makes this more than a numbers game. Streaming: Continuous transmission of media content over the Internet, instead of the media file being sent first as a file and then opened after it has been downloaded. Transcode: Used interchangeably with encode and conversion. Typically changing one media format to another. Usually involves compression to make the final product into a smaller delivery package. Come back next week for the second installment of Scott’s video conversion blog series, focusing on digitizing your VHS tape library and preparing those files for streaming!